So Frank is doing well and on the mend and, frankly, she is amazing. So was her refrigerator the first week after her surgery. You opened the door and the Hallelujah chorus played. But of course: when someone we love is in need of comfort or sustenance, or in the midst of healing, what do we do? We bring food. When I miscarried a baby in 2002, my parents were there in an hour with a pot of chicken soup. Frank came a day later with hot chicken sandwiches from Boston Market. Chicken is a no-brainer for comfort. Someone in trouble? Broken heart? Troubled soul? Stuffy nose? I must roast a chicken. When I was diagnosed with thyroid cancer in 2003 (it was a bad couple of years, don't ask) my friend Becky showed up at my kitchen door with pyrex containers filled with barbecued chicken, potato salad and brownies. This combination of foods might mean "picnic" to most people, but to me, they will always be Becky and her firm, clear loyalty and love, at my kitchen door in my time of need. For healing properties, however, you must go with slightly heartier stuff. I made my turkey meatballs for Frank, two ways: medium-sized ones plain, and tiny ones in wedding soup. I brought that over with some grilled vegetables and a loaf of ciabatta. This all paled in comparison to what her neighbor had bestowed earlier in the day: mozzarella-stuffed meatballs in gravy. Now when I say gravy, I don't mean the sauce for roast chicken or pot roast. I mean gravy like the Italians mean it on Sundays. Ragù if you want to get technical, but it's gravy. Frank's husband and I have been talking about and trying to dissect this completely amazing gravy for ten days now. And no, the recipe is not simply given out to the mere mortals. I've been scouring recipes in the slow-cooker books I own and searching online to try and replicate the holy and wholly secret gravy of Frank's neighbor. It had layers of meat in it: chicken and short ribs and possibly sausage, suspended in rich tomato sauce. Possibly it had crack in it as well, I'm just saying. So what I ended up with is a mongrel recipe that picked and chose between recipes I found online, and a ragù from my slow-cooker book. It's still open to interpretation and tweaking, and I don't know if you could call it authentic. But it tasted pretty damn good, therefore I will call it mine. Heat 2 tsp olive oil in heavy skillet over medium-high heat. Squeeze sausage out of its casings and brown well in skillet, breaking up with the side of a wooden spoon. I don't know why, but I find breaking up sausage with the side of my wooden spoon to be an extremely tedious chore. Remove sausage to paper-towels to drain, then place in slow cooker. In the rendered sausage fat, brown the chicken thighs 3-4 minutes each side. Add to slow cooker. Season steak tips with salt and pepper, then brown in the skillet in batches. Don't crowd the pan or it will steam the meat, not brown it. Put meat in slow cooker. Deglaze the pan with the red wine, scraping up bits from the bottom with the wooden spoon (which I never find to be a tedious chore). Pour wine over meat in cooker. Add another tablespooon olive oil to skillet and heat. 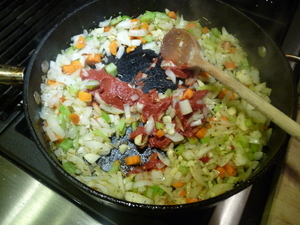 Saute onion, garlic, celery, carrot, oregano, and rosemary until vegetables lose their raw look, about 3-4 minutes. 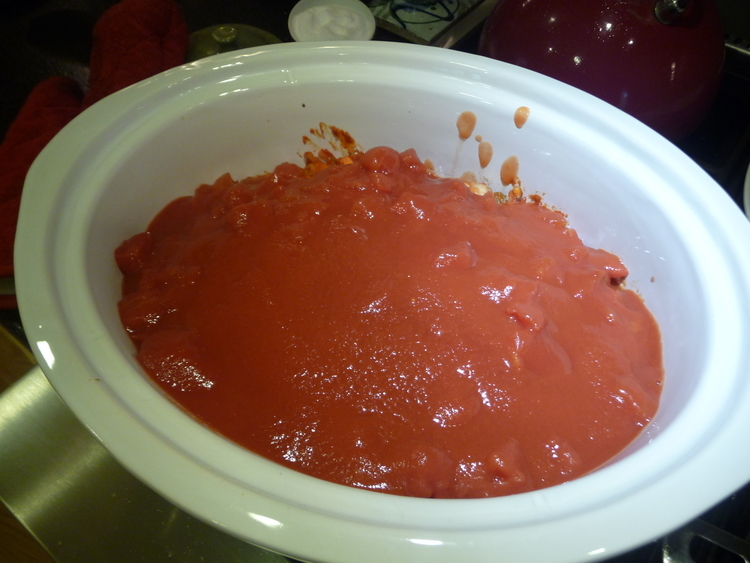 Add can of tomato paste and stir until vegetables are coated well. Cook another 2-3 minutes and then add to slow cooker on top of the meat. Add tomatoes, tomato sauce, and broth (or tomato juice) to cooker. Cover and set to Low for 8 to 10 hours. Then walk away. Just walk away. You want the longest cooking time you can: mine went from 1PM to 10PM and it was a beautiful thing. Before serving, skim fat off surface, and stir in chopped parsley and basil. Serve over pasta or polenta, or just eat a bowlful by itself. That's what I did for lunch. Yum. Oh very very yum. Yes indeed. Can we get in closer, please?